Hello, I have a 2018 Silverado, around 11000 miles on it. 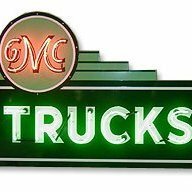 Driving the other day, lost power around 35 mph, pulled into a parking lot, re started the truck and checked to make sure I was in 2wd etc. Began driving again, toward home due to something being wrong and same issue occurred including check engine light. Had vehicle towed Friday night when it happened, at dealer now which isn't open until tomorrow. Has anyone experienced anything similar? 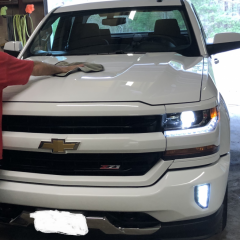 2018 Silverado Z71 5.3L with 14K miles. DIC fuel average indicates 10.3% better fuel economy then actual MPG. 28 fill-ups and reset each time. Any way to calibrate meter? 1% variance maximum variance between each of 28 fill-ups. Thanks for any assistance. Truck is 100% stock including tires. Just purchased a 2018 z71 after the torque converter died on my 2015. Really like the newer front end, however I have noticed a lot of wind noise from my drivers window vs my 2015 model, anyone seen this issue? Has anyone had a rear compressor issue with a new Yukon XL Denali? My wife and I bought the vehicle at the beginning of October 2018 and within a month the rear compressor began running excessively. We took it into the dealership with bought it from and the service rep heard the noise but was unable to reproduce it later in the day with the technician so they sent us away with the vehicle. The noise became more and more regular so we took it to a dealership near our house and they heard it and acknowledged the problem, this lead them to replacing the rear compressor. The change of the rear compressor didn't do the trick and the excessive running persisted, this is where the frustration really set in. The service technicians were going to run diagnostics and service the vehicle after we brought it in MLK Day. The service department manager interrupted the process and essentially tried to bully my wife into accepting the fact that this is normal behavior for a GMC Denali line vehicle. She left the dealership in tears. I called the service manager in disagreement with 1) his treatment of my wife and 2) disputing the fact this is normal. His response was the discharge the video with a bogus report emphasize the vehicle was in intended working condition. Now the Denali is sitting at another dealership while they try to replicate the issue. It occurs 30-40% of the trips we take in the vehicle and the rear compressor will run anywhere from a few seconds to 20 minutes. Has anyone else had this issue and found a resolution? I'm to the point I'm almost willing to just sell the vehicle back for a loss to be rid of it. Its been awhile since I've put up an update post on what I have done to my truck in the past few months. So here is the list.... -RC 2 inch leveling kit -Carven performance exhaust ( Competition muffler ) -Aftermarket taillights ( returning soon as they already have issues ) -future planned taillights are morimoto's -Black bowtie swap front and rear -I may get aftermarket headlights in the future if prices go down. -Custom HD towing mirrors ( The front LED turn signals are sequential ) -20 inch light bar mounted onto a license plate bracket mount -20x10 -25 offset dropstar 655bm -33x12.5 toyo open country RT's -Front end air dam removal with trimming for tires -LED turn signal bulbs All these mods were done myself except for the tow mirrors since i had them done at my Chevy dealer so that i made sure everything worked properly and was warrantied for the wiring harness. Please give me your thoughts and opinions on my build and give me any pointers o what i should do next to the truck. I'm thinking about getting a cold air inductions CAI next. 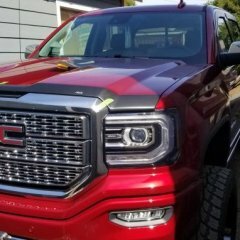 I have a 2018 GMC Sierra 1500 Denali. I just installed the 2” Rough Country front leveling kit. I couldn’t do the 2.5” because my truck has the stamped control arms. The rear of my truck still has about a 1.5” lift/rake compared to the front that I am sure is caused by the rear lift blocks since it is 4WD. Can I remove the rear blocks safely? Or will it cause any damage to my Magneride suspension? What are my options to lower the rear to match the front of my truck now? I am wanting to trade in my 14 silverado 1500 for something thats rated to pull more weight. 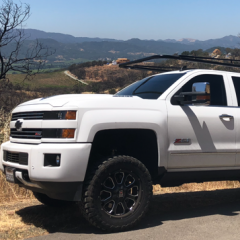 I notice on Chevrolet's website that the commercial silverado 1500 w/ 3.73 rear axle ratio has a 15000/16700lbs w max trailering package rating. Every dealership I've called doesn't know what I am talking about so can someone verify for me that this configuration of the Silverado exists?! 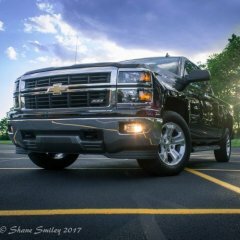 I just purchased a new 2018 Silverado LT Z71 4wd crew cab short bed and am planning on putting the zone 4.5" lift kit on the truck with fox shocks. I love the look of deep dish rims and am leaning toward Hostile sprockets. I am wondering 2 things. 1. if going with a 20x12 on 33 m/t and -44 offset, how much cutting would be involved to solve the rubbing issue and would those cuts be visible with the wheels mounted from the outside? 2. What is the meatiest size someone would recommend for the Hostiles on 33's without having to cut and without rubbing on the 4.5" lift? Seen alot of posts like this but none that quite answer my question. 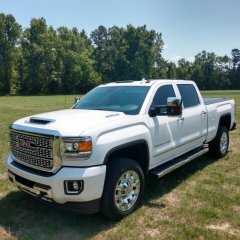 I have a 2018 Sierra 1500 Denali with the 6.2. I am thinking about installing an electric exhaust cut out before the muffler. (For arguments sake let's say my best friend is the warranty manager at my local dealership so I am not concerned about warranty mumbo) What I'd like to know is if I am going to run into any check engine light or any other messages popping up that she will pissed at me about it. I noticed alot of people with '14s and '15s not having issues with them but I feel like this 2018 has so many sensors and is so touchy that I'm hoping to hear from someone on here with the same year that has done it or knows of someone who has? I dont have any oxygen sensors back that far but is this engine computer smart enough to realize there is no backpressure from the muffler or something like that. I may just be being paranoid but really dont want to have to look at an idiot light over it. Wouldn't be worth it..or would it Any logical input would be very appreciated!